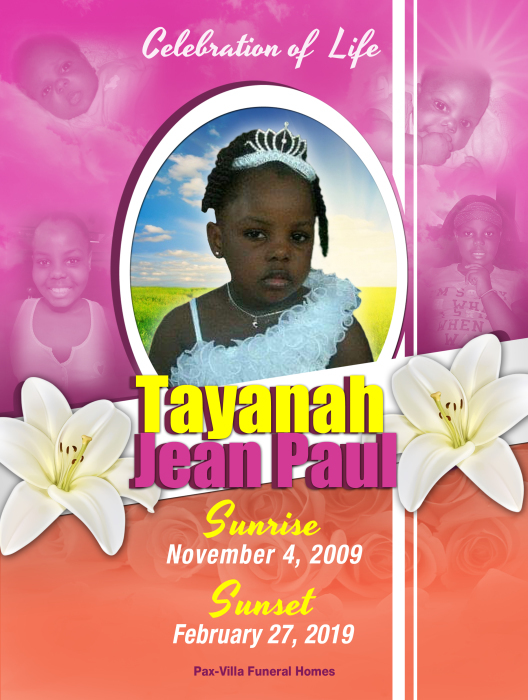 Tayanah Shelcy Edwidge Jean Paul, affectionately known as ‘Tayou,’ was born on November 4th, 2009. Subsequent to the tragic earthquake in Haiti, Tayanah moved to the U.S. As she grew up, she fell in love with dancing and singing. She was also extremely smart and adorable. She was very close to her family and friends; She smiled often and loved everyone and everything around her. Between us, our relationship was more than father/daughter and we spoke every day. We did our homework together daily. Tayanah was also my English teacher. I remember, one day, I mispronounced a word, she promptly corrected me and asked me to repeat the word again. Unfortunately, I still pronounced it wrongly to this day. Tayou said to me, ‘wouyyy Daddy, tet ou di”. Two days before she passed away, we spent 1:37minutes on the phone discussing her dreams and aspirations, being a great dancer, singer, a great nurse or a great Doctor/Physician; when I asked why she would like to be one of those professionals, she answered “Dad, too many people are suffering, so I would like to have an opportunity to help and make a small contribution”. Unfortunately, she didn't get the chance to see her dream come true. God has decided otherwise. As a parent, I’ve always said that when I die, my kids will bury me. Once again, I surmise God has decided otherwise. Tayou, I loved you, I love you, and I will always love you. I know you were, you are and you will always be proud of your mom and dad. From this point forth, I know I have an Angel in Heaven. Stay In Peace Tayou, until my day arrives to meet with you once again know that I love you forever and ever. God has given, God has taken away, to God be the Glory!! !